Science tells us obesity is a chronic disease. Why does the outmoded and injurious notion that it is a problem of willpower persist? In Dante Alighieri’s Divine Comedy the narrator meets a man named Ciacco who had been sent to Hell for the “Damning sin of Gluttony.” According to Catholic theology, in order to end up in Hell one must willfully commit a serious sin. So Dante believed that fat people chose to be fat. This antiquated view of the cause of obesity is still widespread, even among medical professionals. The consequences of this misconception are significant, because it forms the basis for the discrimination suffered by the obese; for the wasting of scarce resources in attempts to change lifestyle habits by public education; and for the limited availability of subsidized obesity treatments. While obesity is often labeled a lifestyle disease, poor lifestyle choices alone account for only a 6 to 8 kg weight gain. The body has a powerful negative feedback system to prevent excessive weight gain. The strongest inhibitor of hunger, the hormone leptin, is made by fat cells. A period of increased energy intake will result in fat deposition, which will increase leptin production. Leptin suppresses hunger and increases energy expenditure. This slows down weight gain. To become obese, it may be necessary to harbor a genetic difference that makes the individual resistant to the action of leptin. Evidence from twin and adoption studies suggests that obesity has a genetic basis, and over the past two decades a number of genes associated with obesity have been described. The most common genetic defect in European populations leading to severe obesity is due to mutations in the gene coding for the melanocortin 4 receptor (MCR4). Still, this defect can explain severe obesity in only approximately 6 percent to 7 percent of cases (J Clin Invest, 106:271-79, 2000). Other genes have been discovered that can cause milder increases in weight; for example, variants of just one gene (FTO) can explain up to 3 kg of weight variation between individuals (Science, 316:889-94, 2007). Genes do not directly cause weight gain. Rather, genes influence the desire for food and the feeling of satiety. In an environment with either poor access to food or access to only low-calorie food, obesity may not develop even in persons with a genetic predisposition. When there is an abundance of food and a sedentary lifestyle, however, an obesity-prone person will experience greater hunger and reduced satiety, increasing caloric intake and weight gain. Since the 1980s, there has been a rapid rise in the prevalence of obesity worldwide, a trend that likely results from a variety of complex causes. There is increasing evidence, for example, that the development of obesity on individual or familial levels may be influenced by environmental experiences that occur in early life. For example, if a mother is malnourished during early pregnancy, this results in epigenetic changes to genes involved in the set points for hunger and satiety in the developing child. These changes may then become fixed, resulting in a tendency towards obesity in the offspring. The biological basis of obesity is further highlighted by the vigorous defense of weight following weight loss. There are at least 10 circulating hormones that modulate hunger. Of these, only one has been confirmed as a hunger-inducing hormone (ghrelin), and it is made and released by the stomach. In contrast, nine hormones suppress hunger, including CCK, PYY, GLP-1, oxyntomodulin, and uroguanylin from the small bowel; leptin from fat cells; and insulin, amylin, and pancreatic polypeptide from the pancreas. After weight loss, regardless of the diet employed, there are changes in circulating hormones involved in the regulation of body weight. Ghrelin levels tend to increase and levels of multiple appetite-suppressing hormones decrease. There is also a subjective increase in appetite. Researchers have shown that even after three years, these hormonal changes persist (NEJM, 365:1597-604, 2011; Lancet Diabetes and Endocrinology, 2:954-62, 2014). This explains why there is a high rate of weight regain after diet-induced weight loss. Given that the physiological responses to weight loss predispose people to regain that weight, obesity must be considered a chronic disease. Data show that those who successfully maintain their weight after weight loss do so by remaining vigilant and constantly applying techniques to oppose weight regain. These techniques may involve strict diet and exercise practices and/or pharmacotherapy. It is imperative for society to move away from a view that obesity is simply a lifestyle issue and to accept that it is a chronic disease. Such a change would not only relieve the stigma of obesity but would also empower politicians, scientists and clinicians to tackle the problem more effectively. Joseph Proietto was the inaugural Sir Edward Dunlop Medical Research Foundation Professor of Medicine in the Department of Medicine, Austin Health at the University of Melbourne in Australia. He is a researcher and clinician investigating and treating obesity and type 2 diabetes. Why do some obese people actually experience health benefits? In the early 19th century, Belgian mathematician Adolphe Quetelet was obsessed with a shape: the bell curve. While helping with a population census, Quetelet proposed that the spread of human traits such as height and weight followed this trend, also known as a Gaussian or normal distribution. On a quest to define a “normal man,” he showed that human height and weight data fell along his beloved bell curves, and in 1823 devised the “Quetelet Index”—more familiar to us today as the BMI, or body mass index, a ratio of weight to height. Nearly two centuries later, clinicians, researchers, and fitness instructors continue to rely on this metric to pigeonhole people into categories: underweight, healthy, overweight, or obese. But Quetelet never intended the metric to serve as a way to define obesity. And now, a growing body of evidence suggests these categories fail to accurately reflect the health risks—or benefits—of being overweight. The dangers of being overweight, such as a higher risk of heart disease, type 2 diabetes, and other complications, are well known. But some obese individuals—dubbed the “fat fit”—appear to fare better on many measures of health when they’re heavier. Studies have found lower mortality rates, better response to hemodialysis in chronic kidney disease, and lower incidence of dementia in such people. Mortality, it’s been found, correlates with obesity in a U-shaped curve (J Sports Sci, 29:773-82, 2011). So does extra heft help or hurt? To answer that question, researchers are trying to elucidate the metabolic reasons for this obesity paradox. Danaei’s team assessed BMI and metabolic markers such as systolic blood pressure, total serum cholesterol, and fasting blood glucose. The three metabolic markers only explained half of the increased risk of heart disease across all study participants. In obese individuals, the other half appeared to be mediated by fat itself, perhaps via inflammatory markers or other indirect mechanisms (Epidemiology, 26:153-62, 2015). While Danaei’s study was aimed at understanding how obesity hurts health, the results also uncovered unknown mechanisms by which excess adipose tissue might exert its effects. This particular study revealed obesity’s negative effects, but might these unknown mechanisms hold clues that explain the obesity paradox? Other researchers have suggested additional possibilities—for example, that inflammatory markers such as TNF-α help combat conditions such as chronic kidney disease, or that obesity makes a body more capable of making changes to, and tolerating changes in, blood flow depending on systemic needs (Am J Clin Nutr, 81:543-54, 2005). According to endocrinologist Mitchell Lazar at the University of Pennsylvania, the key to explaining the obesity paradox may be two nonexclusive ways fat tissue is hypothesized to function. One mechanism, termed the endocrine theory, suggests that fat cells secrete, or don’t secrete enough of, certain molecules that influence glucose homeostasis in other tissues, such as muscle or liver. The first such hormone to be discovered was leptin; later studies reported several other adipocyte-secreted factors, including adiponectin, resistin, and various cytokines. The other hypothesis, dubbed the spillover theory, suggests that storing lipids in fat cells has some pluses. Adipose tissue might sequester fat-soluble endotoxins, and produce lipoproteins that can bind to and clear harmful lipids from circulation. When fat cells fill up, however, these endotoxins are stashed in the liver, pancreas, or other organs—and that’s when trouble begins. In “fat fit” people, problems typically linked to obesity such as high cholesterol or diabetes may be avoided simply because their adipocytes mop up more endotoxins. To Lazar, McAuley, and other researchers, it’s increasingly evident that BMI may not be that metric. Finding better ways to assess a healthy weight, however, has proven challenging. Researchers have tested measures, such as the body shape index (ABSI) or the waist-hip ratio, which attempt to gauge visceral fat—considered to be more metabolically harmful than fat in other body locations. However, these metrics have yet to be implemented widely in clinics, and few are as simple to understand as the BMI (Science, 341:856-58, 2013). Correction (November 2): The original version of this article misattributed the pull quote above. The attribution for this quote has been corrected, and The Scientist regrets the error. J Sports Sci. 2011 May;29(8):773-82. http://dx.doi.org:/10.1080/02640414.2011.553965. In this review, we examine the original obesity paradox phenomenon (i.e. in cardiovascular disease populations, obese patients survive better), as well as three other related paradoxes (pre-obesity, “fat but fit” theory, and “healthy” obesity). An obesity paradox has been reported in a range of cardiovascular and non-cardiovascular conditions. Pre-obesity (defined as a body mass index of 25.0-29.9 kg · m⁻²) presents another paradox. Whereas “overweight” implies increased risk, it is in fact associated with decreased mortality risk compared with normal weight. Another paradox concerns the observation than when fitness is taken into account, the mortality risk associated with obesity is offset. The final paradox under consideration is the presence of a sizeable subset of obese individuals who are otherwise healthy. Consequently, a large segment of the overweight and obese population is not at increased risk for premature death. It appears therefore that low cardiorespiratory fitness and inactivity are a greater health threat than obesity, suggesting that more emphasis should be placed on increasing leisure time physical activity and cardiorespiratory fitness as the main strategy for reducing mortality risk in the broad population of overweight and obese adults. Obesity, insulin resistance, and cardiovascular disease. Recent Prog Horm Res. 2004;59:207-23. The ability of insulin to stimulate glucose disposal varies more than six-fold in apparently healthy individuals. The one third of the population that is most insulin resistant is at greatly increased risk to develop cardiovascular disease (CVD), type 2 diabetes, hypertension, stroke, nonalcoholic fatty liver disease, polycystic ovary disease, and certain forms of cancer. Between 25-35% of the variability in insulin action is related to being overweight. The importance of the adverse effects of excess adiposity is apparent in light of the evidence that more than half of the adult population in the United States is classified as being overweight/obese, as defined by a body mass index greater than 25.0 kg/m(2). The current epidemic of overweight/obesity is most-likely related to a combination of increased caloric intake and decreased energy expenditure. In either instance, the fact that CVD risk is increased as individuals gain weight emphasizes the gravity of the health care dilemma posed by the explosive increase in the prevalence of overweight/obesity in the population at large. Given the enormity of the problem, it is necessary to differentiate between the CVD risk related to obesity per se, as distinct from the fact that the prevalence of insulin resistance and compensatory hyperinsulinemia are increased in overweight/obese individuals. Although the majority of individuals in the general population that can be considered insulin resistant are also overweight/obese, not all overweight/obese persons are insulin resistant. Furthermore, the cluster of abnormalities associated with insulin resistance – namely, glucose intolerance, hyperinsulinemia, dyslipidemia, and elevated plasma C-reactive protein concentrations — is limited to the subset of overweight/obese individuals that are also insulin resistant. Of greater clinical relevance is the fact that significant improvement in these metabolic abnormalities following weight loss is seen only in the subset of overweight/obese individuals that are also insulin resistant. In view of the large number of overweight/obese subjects at potential risk to be insulin resistant/hyperinsulinemic (and at increased CVD risk), and the difficulty in achieving weight loss, it seems essential to identify those overweight/obese individuals who are also insulin resistant and will benefit the most from weight loss, then target this population for the most-intensive efforts to bring about weight loss. After weight loss, changes in the circulating levels of several peripheral hormones involved in the homeostatic regulation of body weight occur. Whether these changes are transient or persist over time may be important for an understanding of the reasons behind the high rate of weight regain after diet-induced weight loss. Weight loss (mean [±SE], 13.5±0.5 kg) led to significant reductions in levels of leptin, peptide YY, cholecystokinin, insulin (P<0.001 for all comparisons), and amylin (P=0.002) and to increases in levels of ghrelin (P<0.001), gastric inhibitory polypeptide (P=0.004), and pancreatic polypeptide (P=0.008). There was also a significant increase in subjective appetite (P<0.001). One year after the initial weight loss, there were still significant differences from baseline in the mean levels of leptin (P<0.001), peptide YY (P<0.001), cholecystokinin (P=0.04), insulin (P=0.01), ghrelin (P<0.001), gastric inhibitory polypeptide (P<0.001), and pancreatic polypeptide (P=0.002), as well as hunger (P<0.001). Along with diet, exercise, and behavior modification, drug therapy may be a helpful component of treatment for select patients who are overweight or obese. Liraglutide is a glucagon-like peptide-1 (GLP-1) receptor agonist, used for the treatment of type 2 diabetes, and can promote weight loss in patients with diabetes, as well as those without diabetes. Bruce Spiegelman has spent his career at the forefront of adipocyte differentiation and metabolism. Spiegelman has stuck with studying the biology and differentiation of fat cells for more than 30 years. While looking for the master transcriptional regulator of fat development—which his laboratory found in 1994—Spiegelman’s group also discovered one of the first examples of a nuclear oncogene that functions as a transcription factor, and, more recently, the team found that brown fat and white fat come from completely different origins and that brown and beige fat are distinct cell types. Spiegelman was also the first to provide evidence for the connection between inflammation, insulin resistance, and fat tissue. Here, Spiegelman talks about his strong affinity for the East Coast, his laboratory’s search for molecules that can crank up brown fat production and activity, and the culture of his laboratory’s weekly meeting. Embracing molecular biology. Spiegelman initially joined Arthur Pardee’s laboratory, but switched when Pardee left Princeton for Harvard University in 1975. Because he was already collaborating with Marc Kirschner, a cell biologist and biochemist who studies the regulation of the cell cycle and how the cytoskeleton works, it was an easy transition to transfer to the new laboratory. In Kirschner’s group, Spiegelman became the cell biologist among many protein biochemists working on microtubule assembly in vitro. Rather than understanding how the proteins fit together to form the filamentous structures, Spiegelman wanted to understand what controlled their assembly inside cells. Working in mammalian cells, Spiegelman published three consecutive Cell papers on how microtubule assembly occurs in vivo. The firstpaper, from 1977, demonstrated that a nucleotide functions to stabilize the tubulin molecule rather than to regulate tubulin assembly in vivo. Relating to Sisyphus. The transition from doing a postdoc to setting up his own laboratory was “very exciting and terribly stressful,” says Spiegelman. “When I think back, I always tried to be professional with my laboratory, but I was so stressed at suddenly being on my own with no management training.” The people resources he had encountered in his graduate and postdoctoral training labs were also not there yet, and he says his first publication as a principal investigator was like pushing a rock up a hill. But eventually, Spiegelman’s lab built a reputation and reached a critical mass of talented people who advanced the science. Again in 1983, Spiegelman produced a publication showing that morphological manipulation can affect gene expression and adipose differentiation. A wider scope. In 1993, graduate student Gökhan Hotamisligil found that tumor necrosis factor-alpha(TNF-α), is induced in the fat tissue of rodent models of obesity and diabetes. The paper sparked the formation of the field of immunometabolism and resulted in the expansion of Spiegelman’s lab into the physiology arena, partly thanks to the guidance of C. Ronald Kahn and Jeff Flier, who both study metabolism and diabetes. But the work initially encountered pushback, says Spiegelman, partly because it was the merging of two fields. Fat color palette. Brown fat tissue, abundant in infants but scarce in adults, is a metabolically active form of fat that is chock full of mitochondria and is found in pockets in the body distinct from white fat tissue.Pere Puigserver, then a postdoc in Spiegelman’s lab, found that the coactivator PCG-1, binding to PPARγ and other nuclear receptors, could stimulate mitochondrial biogenesis. The PCG-1 gene is turned on by stimuli such as exercise or a cold environment. Later, postdoc Patrick Seale, Spiegelman, and their colleagues showed brown fat cells derive from the same lineage that gives rise to skeletal muscle. “This was a big surprise, maybe the biggest surprise we ever uncovered in the lab,” says Spiegelman. Demonstrated that adipose tissue synthesizes tumor necrosis factor-alpha (TNF-α), providing the first direct link between obesity, inflammation, insulin resistance, and fat tissue. Obesity triggers a fatty acid synthesis pathway, which in turn helps drive T cell differentiation and inflammation. Y. Endo et al., “Obesity drives Th17 cell differentiation by inducing the lipid metabolic kinase, ACC1,” Cell Reports, 12:1042-55, 2015. Cell Rep. 2015 Aug 11;12(6):1042-55. http://dx.doi.org:/10.1016/j.celrep.2015.07.014. Epub 2015 Jul 30. 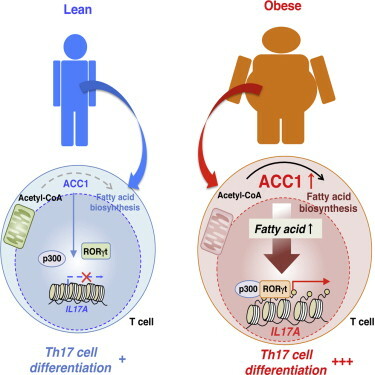 Obesity Drives Th17 Cell Differentiation by Inducing the Lipid Metabolic Kinase, ACC1. Chronic inflammation due to obesity contributes to the development of metabolic diseases, autoimmune diseases, and cancer. Reciprocal interactions between metabolic systems and immune cells have pivotal roles in the pathogenesis of obesity-associated diseases, although the mechanisms regulating obesity-associated inflammatory diseases are still unclear. In the present study, we performed transcriptional profiling of memory phenotype CD4 T cells in high-fat-fed mice and identified acetyl-CoA carboxylase 1 (ACC1, the gene product of Acaca) as an essential regulator of Th17 cell differentiation in vitro and of the pathogenicity of Th17 cells in vivo. ACC1 modulates the DNA binding of RORγt to target genes in differentiating Th17 cells. In addition, we found a strong correlation between IL-17A-producing CD45RO(+)CD4 T cells and the expression of ACACA in obese subjects. Thus, ACC1 confers the appropriate function of RORγt through fatty acid synthesis and regulates the obesity-related pathology of Th17 cells. FEEDING INFLAMMATION: When mice eat a diet high in fat, their CD4 T cells show increased expression of the fatty acid biosynthesis gene Acaca, which encodes the enzyme ACC1 (1). Products of the ACC1 fatty acid synthesis pathway encourage the transcription factor RORγt to bind near the gene encoding the cytokine IL-17A (2). There, RORγt recruits an enzyme called p300 to modify the genome epigenetically and turn on IL-17A. The memory T cells then differentiate into inflammatory T helper 17 cells. Obesity often comes with a side of chronic inflammation, causing inflammatory chemicals and immune cells to flood adipose tissue, the hypothalamus, the liver, and other areas of the body. Inflammation is a big part of what makes obesity such an unhealthy condition, contributing to Type 2 diabetes, heart disease, cancers, autoimmune disorders, and possibly even neurodegenerative diseases. To better understand the relationship between obesity and inflammation, Toshinori Nakayama, Yusuke Endo, and their colleagues at Chiba University in Japan started with what often leads to obesity: a high-fat diet. They fed mice rich meals for a couple of months and looked at how gene expression in the animals’ T cells compared to gene expression in the T cells of mice fed a normal diet. Most notably, they found increased expression ofAcaca, a gene that codes for a fatty acid synthesis enzyme called acetyl coA carboxylase 1 (ACC1). They went on to show that the resulting increase in fatty acid levels pushed CD4 T cells to differentiate into inflammatory T helper 17 (Th17) cells. Th17 cells help fight off invading fungi and some bacteria. But these immune cells can also spin out of control in autoimmune diseases such as multiple sclerosis. Nakayama’s team showed that either blocking ACC1 activity with a drug called TOFA or deleting a key portion of Acaca in mouse CD4 T cells reduced the generation of pathologic Th17 cells. Overexpressing Acaca increased Th17-cell generation. The researchers also demonstrated that mice fed a high-fat diet had elevated susceptibility to a multiple sclerosis–like disease, and that TOFA reduced the symptoms. “This is a very intriguing finding, suggesting not only that obesity can directly induce Th17 differentiation but also indicating that pharmacologic targeting of fatty acid synthesis may help to interfere with obesity-associated inflammation,” Tim Sparwasser of the Twincore Center for Experimental and Clinical Infection Research in Hannover, Germany, says in an email. Sparwasser and his colleagues had previously shown that ACC1 is required for the differentiation of Th17 cells in mice and humans. Nakayama explains that CD4 T cells must undergo profound metabolic changes as they mature and differentiate. “The intracellular metabolites, including fatty acids, are essential for cell proliferation and cell growth,” he says in an email. When fatty acid levels in T cells increase, the cells are activated and begin to proliferate. “It’s a nice illustration of how, really, immune response is so highly connected to the metabolic state of the cell,” says Gökhan S. Hotamisligil of Harvard University’s T.H. Chan School of Public Health who was not involved in the study. “The immune system launches its responses commensurate with the sources of nutrients and energy from the environment,” he adds in an email. There are still missing pieces in the path from high-fat diet to increased Acaca expression to ACC1’s influence on T-cell differentiation. It also remains to be seen how this plays out in obese humans, although Nakayama and colleagues did show that inhibiting ACC1 reduced pathologic Th17 generation in human immune cell cultures, and that the T cells of obese humans contain elevated levels of ACC1 and show signs of increased differentiation into Th17 cells. The prevalence of obesity has been increasing worldwide, and obesity is now a major public health problem in most developed countries (Gregor and Hotamisligil, 2011, Ng et al., 2014). Obesity-induced inflammation contributes to the development of various chronic diseases, such as autoimmune diseases, metabolic diseases, and cancer (Kanneganti and Dixit, 2012, Kim et al., 2014,Osborn and Olefsky, 2012, Winer et al., 2009a). A number of studies have pointed out the importance of reciprocal interactions between metabolic systems and immune cells in the pathogenesis of obesity-associated diseases (Kaminski and Randall, 2010, Kanneganti and Dixit, 2012, Kim et al., 2014, Mauer et al., 2014, Stienstra et al., 2012, Winer et al., 2011). Elucidating the molecular mechanisms by which naive CD4 T cells differentiate into effector T cells is crucial for understanding helper T (Th) cell-mediated immune pathogenicity. After antigen stimulation, naive CD4 T cells differentiate into at least four distinct Th cell subsets: Th1, Th2, Th17, and inducible regulatory T (iTreg) cells (O’Shea and Paul, 2010, Reiner, 2007). Several specific master transcription factors that regulate Th1/Th2/Th17/iTreg cell differentiation have been identified, including T-bet for Th1 (Szabo et al., 2000), GATA3 (Yamashita et al., 2004, Zheng and Flavell, 1997) for Th2, retinoic-acid-receptor-related orphan receptor γt (RORγt) for Th17 (Ivanov et al., 2006), and forkhead box protein 3 (Foxp3) for iTreg (Sakaguchi et al., 2008). The appropriate expression and function of these transcription factors is essential for proper immune regulation by each Th cell subset. Among these Th cell subsets, Th17 cells contribute to the host defense against fungi and extracellular bacteria (Milner et al., 2008). However, the pathogenicity of IL-17-producing T cells has been recognized in various autoimmune diseases, including multiple sclerosis, psoriasis, inflammatory bowel diseases, and steroid-resistant asthma (Bettelli et al., 2006, Coccia et al., 2012, Ivanov et al., 2006,Leonardi et al., 2012, McGeachy and Cua, 2008, Nylander and Hafler, 2012,Stockinger et al., 2007, Sundrud et al., 2009). We herein identified a critical role that ACC1 plays in Th17 cell differentiation and the pathogenicity of Th17 cells through the control of the RORγt function under obese circumstances. High-fat-induced obesity augments Th17 cell differentiation and the expression of enzymes involved in fatty acid metabolism, including ACC1. Pharmacological inhibition or genetic deletion of ACC1 resulted in impaired Th17 cell differentiation in both mice and humans. In contrast, overexpression of Acaca induced Th17 cells in vivo, leaving the expression ofIfng and Il4 largely unchanged. ACC1 modulated the binding of RORγt to theIl17a gene and the subsequent p300 recruitment in differentiating Th17 cells. Memory CD4 T cells from peripheral blood mononuclear cells (PBMCs) of obese subjects showed increased IL-17A production and ACACA expression. Furthermore, a strong correlation was detected between the proportion of IL-17A-producing cells and the expression level of ACACA in memory CD4 T cells in obese subjects. Thus, our findings provide evidence of a mechanism wherein obesity can exacerbate IL-17-mediated pathology via the induction of ACC1.